NOTE: THIS STRING IS TO BE USED TO RECORD KILLS. PLEASE DO NOT POST YOUR CONGRATS IN THIS STRING. THANKS. PLEASE REMEMBER TO ADD TO THE RUNNING TOTAL. Here is a format you can follow when entering a kill. Just add your kill pictures then copy and paste the format in this post and fill it in. And enter what number kill it is. Texas is now checked off the list. Only 41 states to go! I'm the dork in the middle, my bird's head is next to my head. DATE: Saturday, March 16, 2019. Opening day. RIGHT SPUR: 1 1/8”. Nice and pointy and curved. LEFT SPUR: 1 1/8”. Nice and pointy and curved. 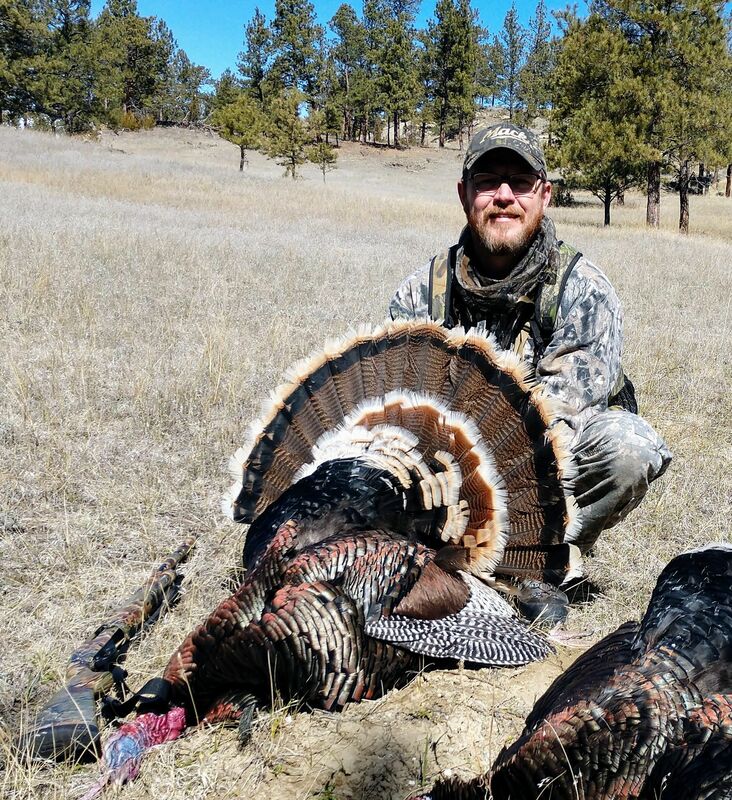 #1 REASON FOR THIS SUCCESSFUL HUNT: Yelps to get cruising bird’s attention. Then the decoys sealed the deal. 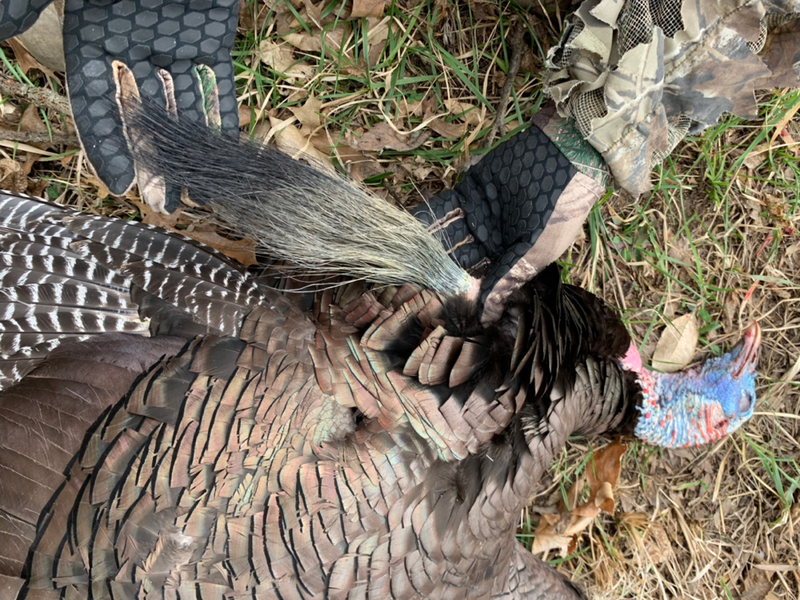 Bonus hunt info: A jake with a barely visible 1” beard came in and started beating on the hen (Avian X inflatable rio hen) decoy 12 yards away. Hard! I was afraid he would knock her over so i tried loudly cutting and yelping to distract him so he would leave her alone but he ignored me. He also ignored the Funky Chicken 2 jake decoy only a few feet away. He was all about attacking the hen decoy. 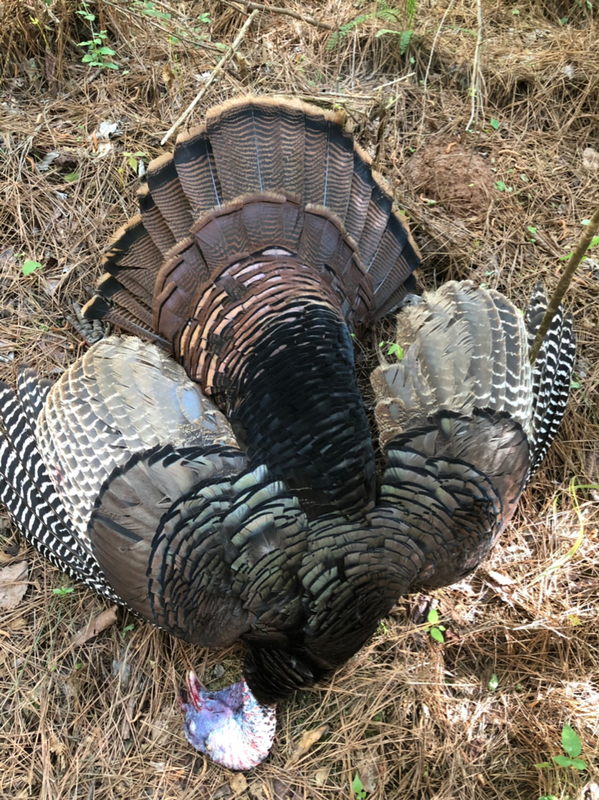 Then i heard a putting approaching the commotion and it was a gobbler (the one cruising through out front that i had been calling to) all super worked up, head a brilliant blue. Both birds now 10 -12 yards away. Then the jake finally succeeded in beating the hen decoy off the stake and onto the ground. 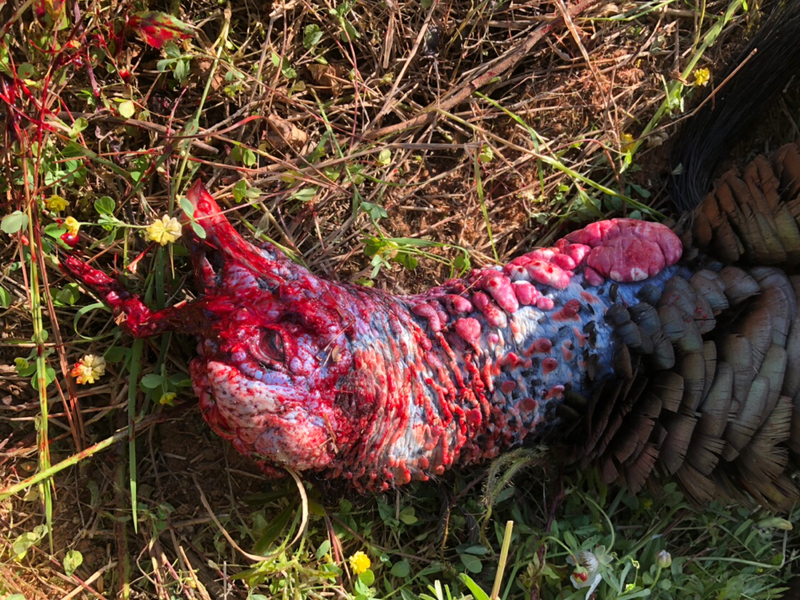 The gobbler did not like that and started to get the heck out if there, i stopped his retreat at 20 yards with a .410. 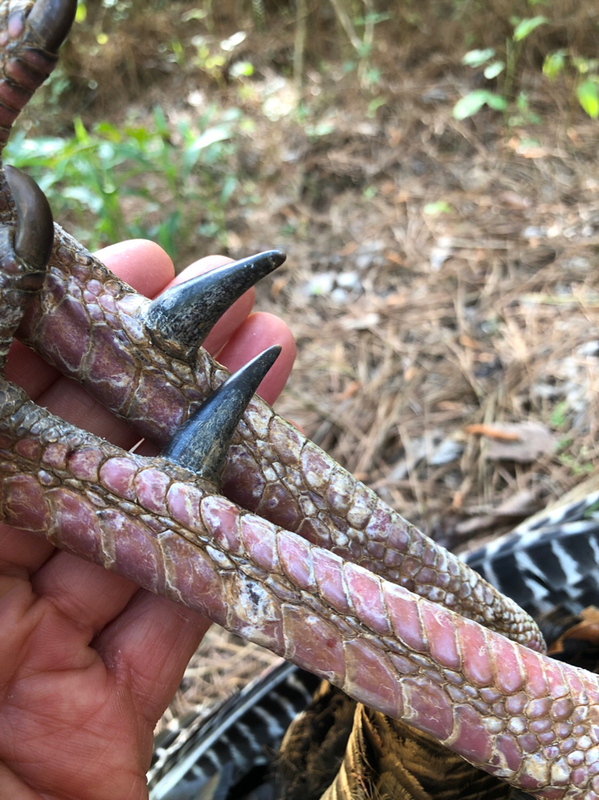 Nice long and curved and pointy spurs. At least a 3 year old. Last edited by Magdump on March 19th, 2019, 9:29 am, edited 1 time in total. 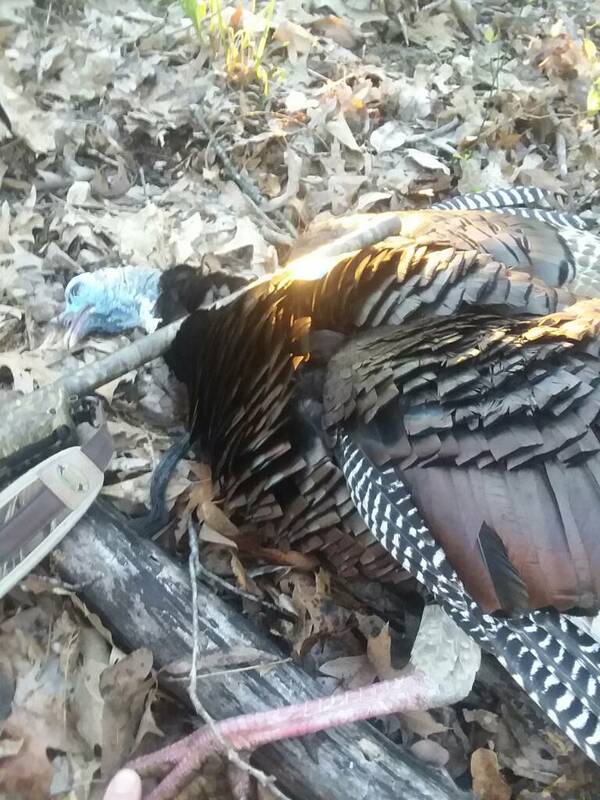 SPURS - spurs both about 3/4"
After picture not to good, he fell and flopped in a large mud puddle. 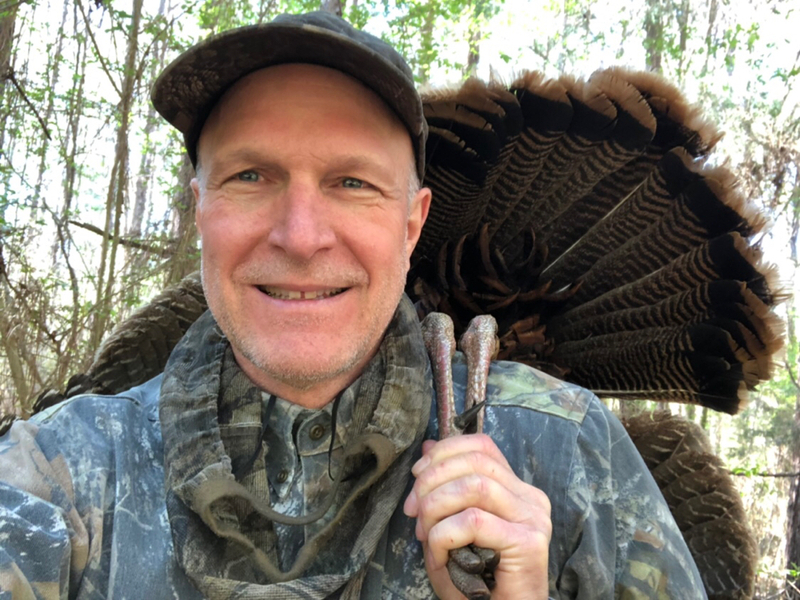 #1 REASON FOR THIS SUCCESSFUL HUNT: being close and there early. 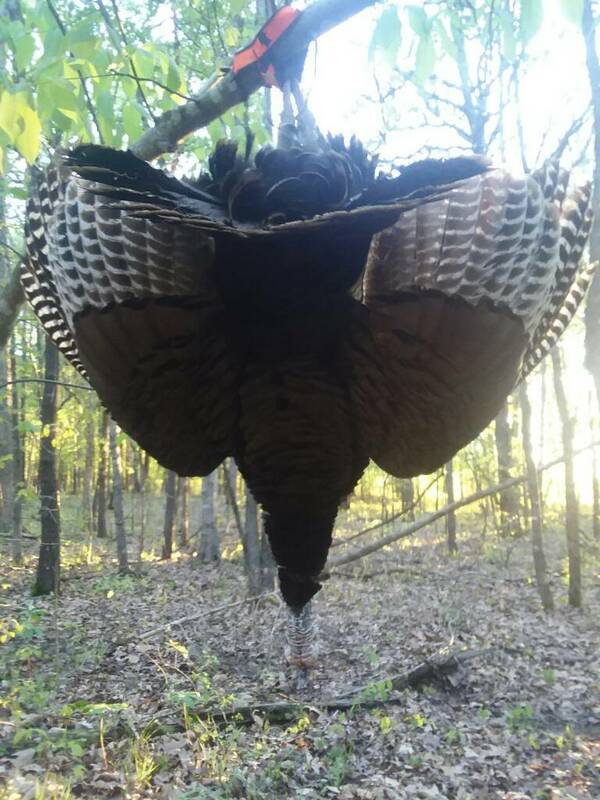 even though i busted him off roost when setting down. he was 30 yards away. but it didnt bother him 30 minutes later. moved 70 yards away. 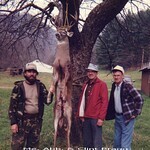 (FOR EXAMPLE: CALLING, SETUP, DECOYS, SHOTGUN, SHOTSHELLS, SCOUTING, CAMO)luck/quick thinking. Struck bird in afternoon. Gobbled very hot, but there was a thick marsh between us that neither of us could navigate, well without flying, and I don't have that skill. Ultimately it happened fast and was the best gobbling bird I've ever killed. 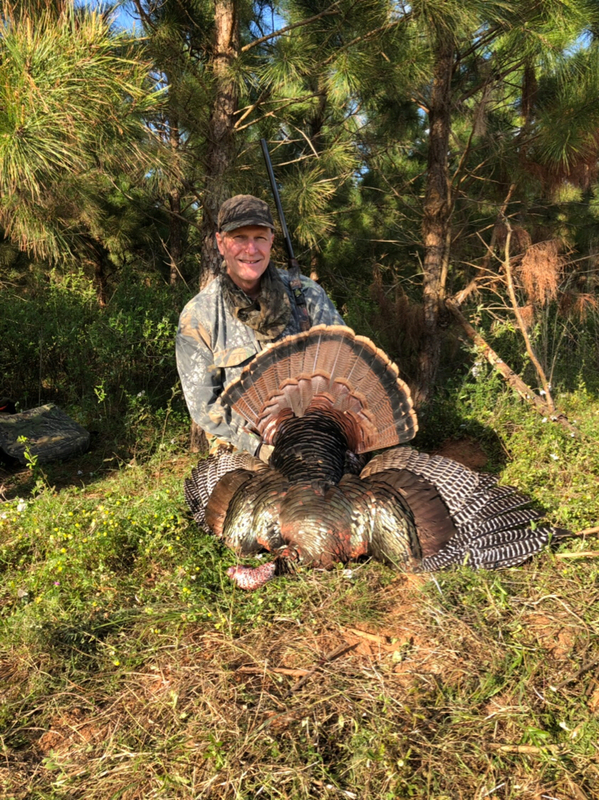 Very fun hunt to kick off Georgia trip with my Dad. 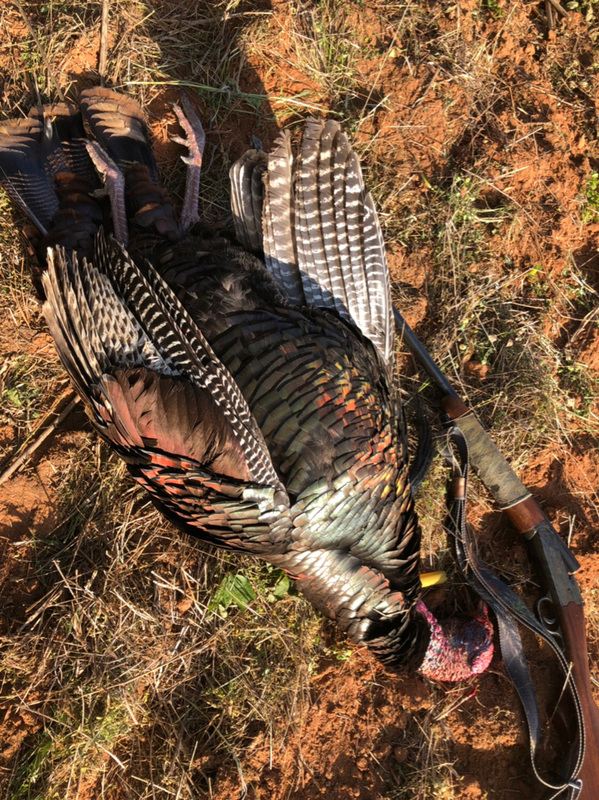 Roosted two gobbling birds yesterday evening. Had called the group in last weekend three times but couldn’t get a clean shot. Setup where I was last Saturday and as it got light saw 5 birds within 25 yards roosted. All were Jakes. Flew down and scratched around to within 3 yards of me and eased on by. The gobblers started gobbling, one in front and one behind me. Jakes clucking and yelping all around me and boom, there’s a fan 75 yards away. 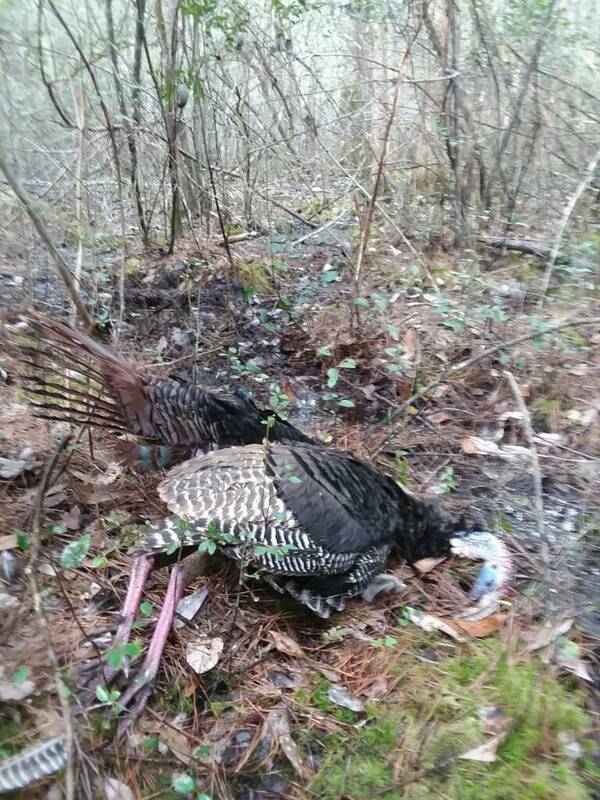 Then there is a second gobbler beside him. One makes a line to me and gets in some thick reeds and struts. The one I killed stayed head held high for a long time looking. He made it to 47 long steps and hit an opening. The closer bird was in stuff too thick to shoot through and would be 5 steps from me when he broke it. I let the bird at 47 steps have a load of Blends. 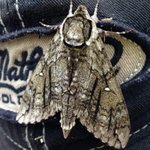 Called this bird in yesterday evening but couldn’t get a shot. 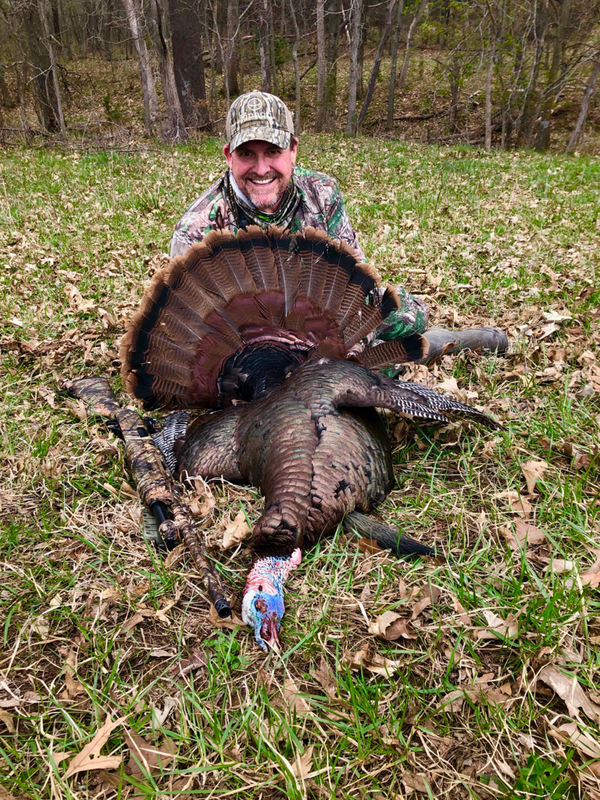 Got in early this morning and he worked perfectly off the roost for 30 minutes of strutting and gobbling inside 40. Shot him at 32 steps. So roosting and knowing patterns of the birds! 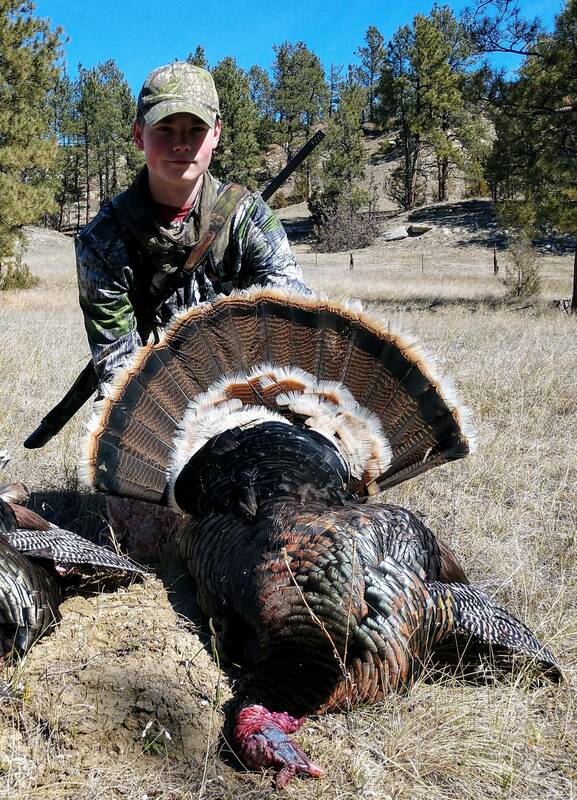 Familiarity with the area, since birds were still packed tight during the early youth season. 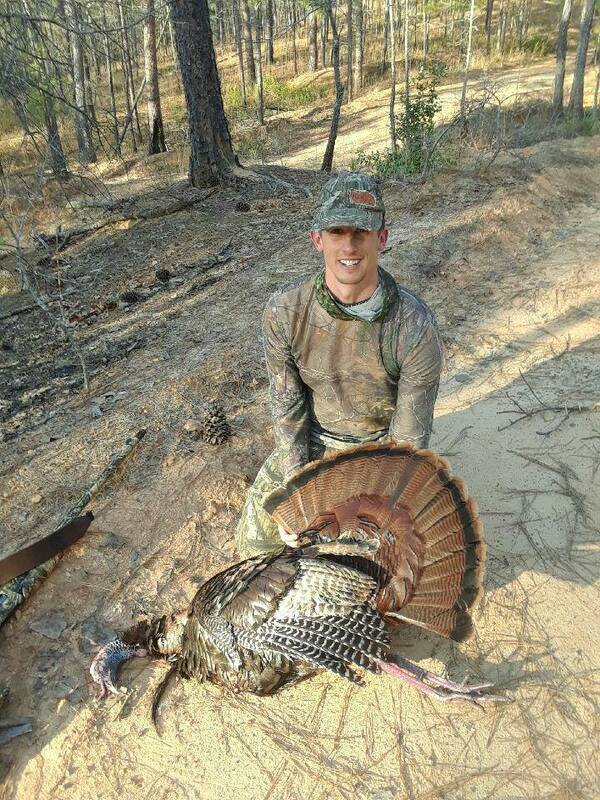 #1 REASON FOR THIS SUCCESSFUL HUNT:. We kept looking until we found a responsive bird(s). Last edited by Hobbes on April 14th, 2019, 7:16 pm, edited 2 times in total. #1 Reason For This Successful Hunt: Scouting , Knew the flocks preferred travel route to and from cornfield . Called him to a spot he was comfortable with . 1# Reason for successful hunt: Hunting an older bird who knows the game too well, this guy didn't & stopped learning today. #1 REASON FOR THIS SUCCESSFUL HUNT: Just got lucky as hell!!! Finally able to set up close enough to the roost, which was on the neighbor's property. The birds went quiet long enough for me to fall asleep. The hens' purrs and peeps woke me up when they sneaked up on me. #1 REASON FOR THIS SUCCESSFUL HUNT: Knew where bird was from previous unsuccessful hunt last week. 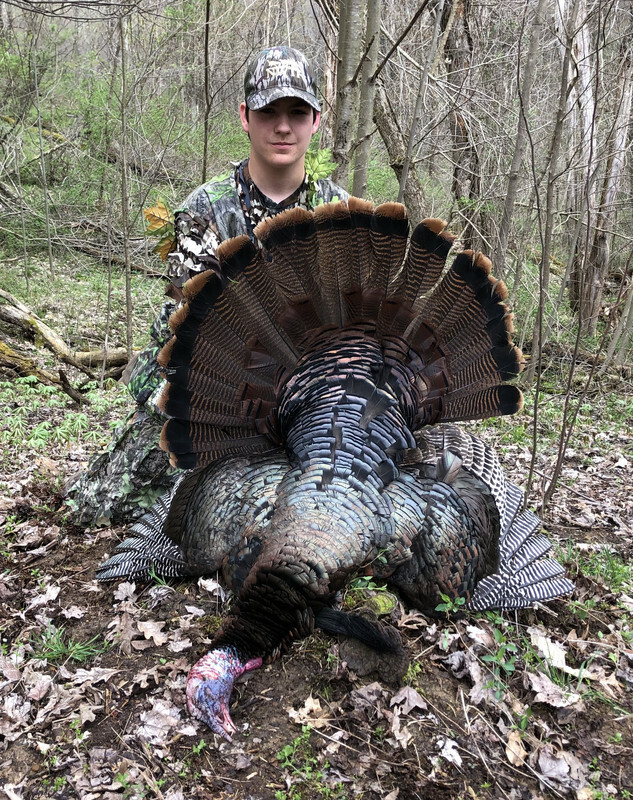 He came right in after just a couple calls off the limb. 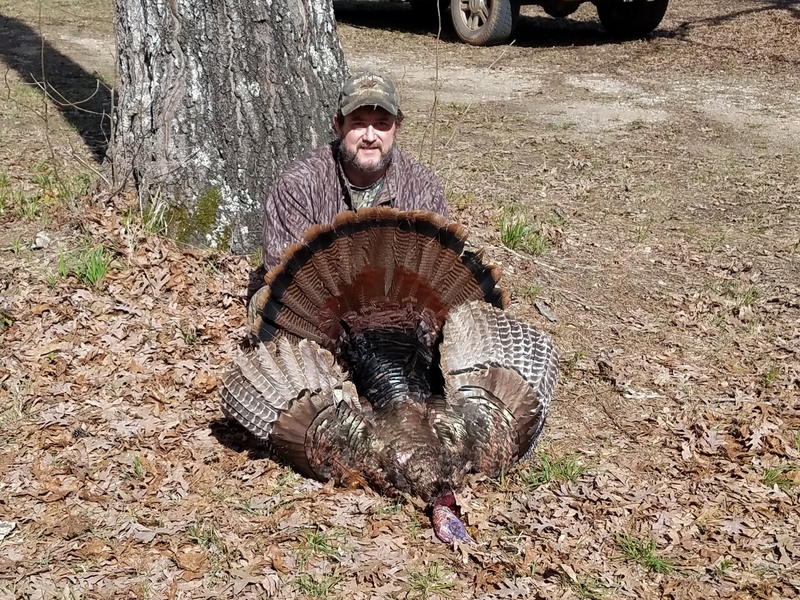 Beard was about jake size but had a full fan and almost 1 inch spurs. 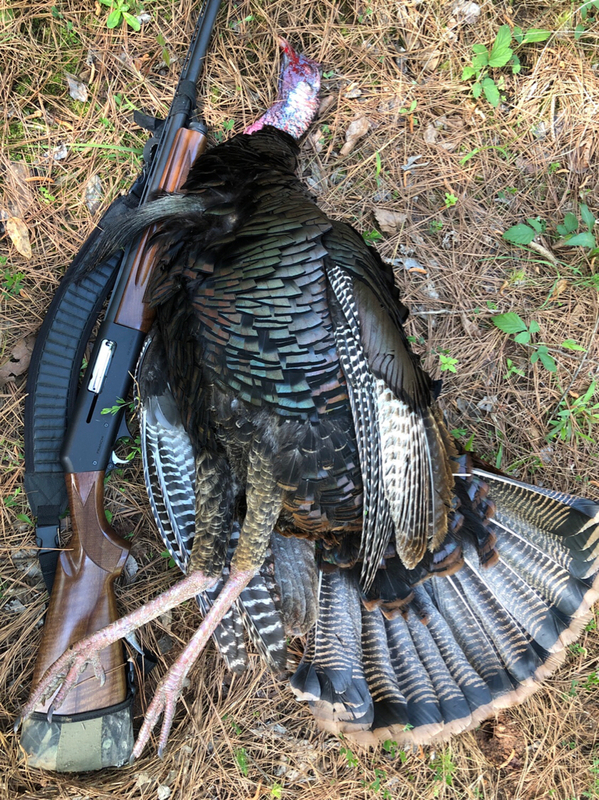 Glad to kill an Arkansas turkey again since I couldn't connect last yeast and have been after them hard all season.